When the pilots first started flying the Baby Breitlings they were distracted by the model wing walker moving around. It may sound odd, but when you fly model planes it's unusual for anything to move on the plane without you, the pilot, controlling it. After a few flights you get used to it though and can concentrate on presenting the plane to the crowd. Sharon on the other hand found it odd to be holding a transmitter but not to be flying the plane. She also flies models and on the first few flights she found she was instinctively watching the plane and trying to fly that rather than operate the wingwalkers. 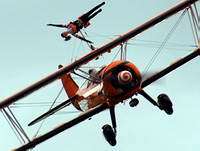 The wingwalkers are operated using the same transmitter you would use to fly a plane. The sticks and switches move the arms, legs and head and a dial controls the rig rotation. Whilst it's easy to actually operate the controls, it is tricky to remember which stick controls which movement. Each arm and leg moves independently, the arms move up and down together and the head also moves. The most important time to get everything right is when you operate the rig. 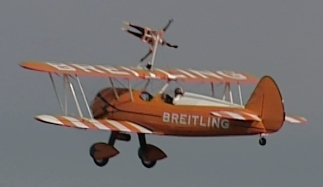 The wingwalkers' legs and arms need to be in the right position when you roate the rig otherwise they get caught in the rigging wires and snap them. It's important to consider the rigging setup. Aside from ensuring safety, it also makes fall protection 100% sure.